Mobilink is a leading cellular service operator in the country that is always trying to facilitate the customers with some appealing and convenient packages so that they may stay in touch with the firm for long time. 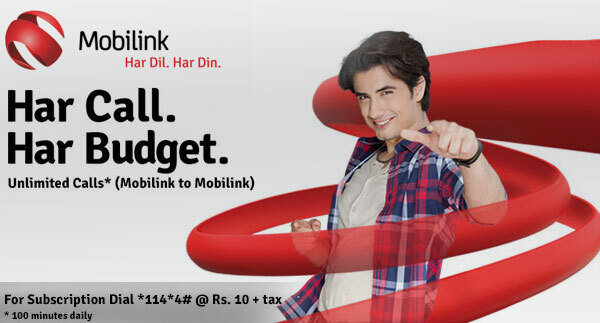 Mobilink is now planning to maintain its position again by launching this Har Din Bundle offer for the users. By using this offer you can stay in touch with your friends and family round the clock. If you want to subscribe to this offer, just dial *114*4#, and the subscription charges will be Rs. 10+tax (Rs.11.95). As per fair usage policy of the company, you can avail 100 minutes for Mobilink to Mobilink numbers, but you will be unable to utilize these 100 minutes for any off-net numbers. The offer is valid for 24 hours after which you will have to subscribe this offer again for the next day. By dialing the command *114*4*2# you can check the remaining free minutes, for which Rs. 0.20+ tax (Rs 0.24) will be charged for a single status report. All prepaid customers can avail this offer. Customers can get information and answers to their queries about this offer by typing the command *114*4*3# and there will be no charges for this inquiry. If you get bored with this offer and want to unsubscribe, simply dial *114**44# and it’s totally free of any charges. On all recharges or bills 15% withholding tax and 19.5% FED will be deducted. Moreover, on each recharge 5% service charges and 5% operational fee will be deducted. This offer is just valid till 31st July, 2013 and can be terminated without prior notification.